This weekend is a chance to live long standing traditions that continue to this day in Tuscany. 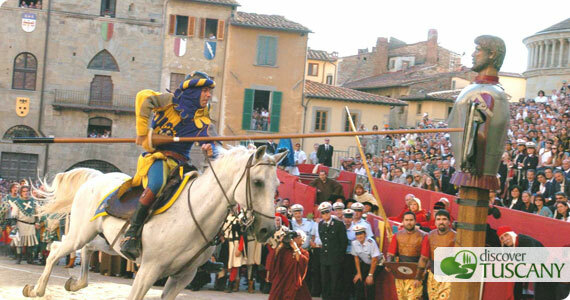 Tomorrow in Arezzo, the first edition of a great historical festival will take place all day: the Giostra del Saracino (or Saracen Joust). The Joust takes places twice per year (in June and September in case you’re not here yet) in Piazza Grande, Arezzo’s beautiful central square. There are many ceremonies tied to the event that have been taking place all of this past week but the main tournament is tomorrow Saturday June 23rd, with parade in historical costume in the morning and tournament in the evening. If you’re in the area, we highly recommend heading that way! If you’re in Florence, Sunday June 24 is the celebration of St. John the Baptist’s feast day, patron saint for the city. Starting at around 4pm there will be a parade in historical costume that makes its way from Piazza Santa Maria Novella through the center as it heads to Piazza Santa Croce, where the final match of the Calcio Storico Fiorentino will be played. The Bianchi (Santo Spirito) will face off the Azzurri (Santa Croce) at around 5pm. 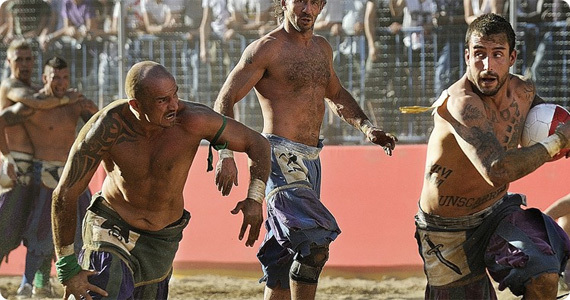 The game is a combination of soccer, rugby, and big time wrestling, all played while wearing 16th century costumes so is definitely a must-see! Can’t see the game in person? If you’re in the Tuscan region, tune into the local TV station RTV38 (channel 15); otherwise, take advantage of the new offering and watch it on live streaming on their website: www.rtv38.it. Another thing to do on Sunday: take advantage and climb to the top of the Arnolfo’s tower of Palazzo Vecchio (reservations are required, read all details here) or to the top of the San Niccolò Tower, which is also opening for the summer on Sunday June 24. Both offer spectacular views of Florence that you can’t get anywhere else and will be open free on this day with guided visits. Fabulous fireworks conclude Florence’s celebrations at around 10pm – head to the Arno river banks to see the show! Since fireworks are launched from Piazzale Michelangelo, most of the square will be off limits from the afternoon so it’s one day when you want to be downtown to see the parade and Calcio Storico rather than up at the Piazzale. Wherever you end up heading, enjoy the nice warm weather this weekend in Tuscany!